Classic American’s Stars & Stripes Car Show, which has been running for more than 30 years, returns to Tatton Park again this summer, celebrating all things America, cars that may be there are Mustangs to Corvettes and Cadillacs to American motorhomes. As always, we bring you some of our best loyal car clubs with themed exhibitions. They are always happy to talk endlessly about the incredible vehicles they have on display, potentially wowing you with their extensive knowledge. Additionally, car lovers have the opportunity to exhibit their car for free at this years’ show. Over 2500 cars from across the pond will be on display, from customised hot rods to pumped-up pick-ups and even a variety of US motorcycles. This year features a massive schedule of entertainment to please anyone and everyone. 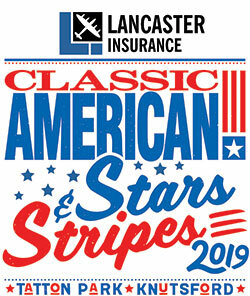 The Classic American Stars & Stripes car show-this year, has a superb line-up of acts in store for you at Tatton Park. We’ve pulled out all the stops take make this one bigger and better than ever. We are bringing to you the best entertainers for a fun-filled and exciting weekend. If you’re in the mood for food or in need of a drink then find yourself heading over to the beer tent- it has amazing live entertainment running from 12pm-4pm! Did you know it’s also one of the heats for Classic American Car of the Year? The Show also features a trade, with specialist traders, parts suppliers and jumble stands offering everything you could ever need. Whatever it is, insurance companies, maintenance puzzles or classic number plate makers, we’re sure it can be found at Tatton Park-usually at a bargain price! (Make sure you don’t miss out). The cars on show are automatically entered into competitions across the weekend where over 70 prestigious awards will be presented each day for various categories such as The Best in Show. Please note: All show exhibits must be pre-booked, don’t forget to download and submit an application form to display your car at this years’ show.